« Ticket to Ride Nordic Countries is available for preorder! The world of BattleLore is about to get a lot bigger… and a little less friendly. We’re introducing a New Epic Adventure Map series for BattleLore that features large scale Epic maps. And the first in the series includes the new Troll Creature figure and two mean and nasty troll adventures. The Epic Adventure series is an exciting new way to experience BattleLore, making it fast and easy to setup and play BattleLore Adventures. For Troll and Country is the first release of the Epic Adventure Map series for BattleLore. It includes a large scale Epic map featuring two Epic Adventures – For Troll and Country and Troll Bridge. The paper map is 47 x 34 inches (120 x 87 cm) and comes ready to play with terrain, obstacles and unit positions pre-printed. Players can just place their BattleLore units and start their adventure. This volume also features the new Troll Creature figure, perfect to use with these or other adventures. For Troll and Country is expected to be available in October from the Days of Wonder web site and your local game retailer. You can preorder your copy now from the Days of Wonder Web Store. The Battlelore Troll Map Epic Adventure will debut this week at GenCon in Indianapolis. A limited number of copies will be available at the Days of Wonder Booth #121. This entry was posted on Monday, August 11th, 2008 at 18:28 and is filed under BattleLore, Games, News. You can follow any responses to this entry through the RSS 2.0 feed. Both comments and pings are currently closed. Will the Troll come with reference cards and/or a special landmark? It looks like the Troll information is printed on the map, which will make it difficult to use the Troll in other scenarios. How often will their be additions to Epic Adventure series? Will there still be other expansions, such as the rumored Heroes expansion? The Troll comes with all its information directly printed on the map, in English, French and German. This map – and similar concepts we are introducing for M44 – are primarily designed for play in public venues (Conventions, which is why we are introducing it at GenCon, Game Store events, etc…). They are not meant as a replacement for other more traditional expansions such as the Heroes. So… we will have to have the map out to use the troll for other maps… As someone who missed out on the hill giant and earth elemental I am not super happy with that decision… information cards for the troll would be much more versatile. other Races & the game world? A series of paper maps was not the BL that was promised. Will there be another way to get the Troll with ref cards ? I have 2 copies and epic, and don’t want to buy a map I could potentially already make myself. Personally, I like the idea of maps as convention give-aways and/or special order items, but would rather see the Troll (with cards) bundled with new figurines (other creatures, heroes, or units), scenarios, and rules/materials into another Specialist Pack. Still, I’ll be looking out for this item (and the new Memoir items) at my FLGS! Since the battle map is designed for tourneys and such, are you going to make the Troll, and its associated rules available elsewhere? You know, since the base game was designed to be played in homes and such. I’m with ColtsFan76 on this one. Suppose I want to use my troll in a game using Call to Arms. No specialist card? Seems wierd. It actually sounds incomplete and hastily thought out – and this is from a dyed-in-the-wool BattleLore fane as can be seen from my comments on BGG. I’m with ColtsFan76 on this one. Suppose I wish to use my troll in a Call to Arms game, how can I do this without a specialist card? This seems incompletely thought out – and this id from a BattleLore fanatic as can be seen from my posts on BGG. but jim, you don’t need a specialist card for creatures anyway. you need a deployment card, so no worries about that. i wonder where DoW is going with this, as it seems to be a series of expansions that will be just maps. hopefully, they don’t all cost 18 dollars; since we can make them on our own anyway. IMHO € 16 is too much for what you get. This can’t be a serious expansion for Battlelore. Maybey you can use it indeed as a demo (free-take-away) on conventions. €16 for a sheet of paper. Did it really took so long for DoW to come up with such a simple expansion? Everbody can make such a map on his own PC and have it printed by the local printshop in full color. If this is what DoW has in store for us regarding Battlelore I fear the game will be on a downhill track. This thing will NOT be added to my Battlelore collection! If I was a DoW investor, I’d be so pissed. they’ve taken a product line that was a license to print money and completely run it into the ground. Hey, DoW, nobody is going to buy this. This is basically $18 for a plastic fig. Without the cards a monster is supposed to come with. And a non-modular map for a modular game. And let’s make the map Epic so the primary way to play the game has no use for this. DoW, I know you’re not bothering to support Battlelore like you were when I bought it, but listen up: I’ve gone from a loyal DoW fan, willing to invest heavily in a new game system, to totally pissed off. After a year of nothing, this “expansion” is a spit in the fans’ face. I will not buy any more Battlelore (barring a serious overhaul and a long time of watching to see if you keep your promises for ocne) and will be very wary to buy any other DoW product. To me, BattleLore’s appeal has always been it ‘s versatility/replayability and it’s high quality components. A static paper map and a figure that can’t easily be integrated into normal gameplay doesn’t seem to offer either of these, but since it has been revealed that this is meant to be a convention focused item, I suppose it’s understandable. Still, I am very disappointed to hear that the Troll won’t come with traditional BL reference cards. Since I already own two of the standard BL maps I’m not really interested in the paper maps, so a full featured troll (along the lines of the hill giant and earth elemental) would have been more of an incentive to pick up this new “expansion”, and could have satisfied the ‘at home’ players in addition to the “public venue” players. However, this is the first new creature we’ve seen since the game’s initial launch, so I guess I’ll have to get it. Maybe I can use my craft knife to cut the map into modular components. Wow, $18 for a new figure and a paper map that I can make with what I already have….. Why can’t we get the Troll by itself to use with all the stuff I’ve already acquired (Calltoarms, Epic, expansions, etc)? After many months of being in the dark about future expansions, I’m very disappointed. i am a big battlore fun and i own all the expansions but i feel that this expansion is not what all battlelore funs are waiting all these months from DoW . I expect something better in the future to keep this game high. i dont know if i am gonna buy it. I have to agree. Although it IS nice to see DoW bringing something new to GenCon for once, I’m not sure this will be something I’m going to buy while I’m there. For one I don’t really want a paper map for any game, and it is a bit strange that the troll figure won’t have its own reference card. I’ve been waiting for new creatures to add to my battlelore set for a long time, so it’s kind of sad to see one appear but in a format I’m not going to get any use out of. Paper maps! Are you serious?!?! Have you guys not listened at all? I have no idea what else to say… It’s like watching a car crash in slow motion. The public seem pretty unanimous on this one, as the messages here attest. Whilst not wanting to offend DOW, I have to say that I myself am a little offended by this concept and their actions. Surely the company realises how passionate Battlelore fans are about this game and its true potential? So why make such a rookie move which not only goes against previous ideals but clearly against what the fans – i.e. the people who are going to buy the product – want? The idea of the Troll not being easily usable with the standard game seems foolish. Why waste resources on the paper (paper!?!?) map, when they could have (presumably) just as easily produced a transferable card – as has been the norm up until now? As the first piece of info in a long time, this does not bode well. A real shame given that Battlelore has not only captured my playing spirit but miraculously managed to enrapture my girlfriend, too. Let’s just have a look at how stupid this idea is. * 4-player Reluctant Allies variant, instructions on using Epic BattleLore in conjunction with Call to Arms Logroño and Road to Najera epics! We strive to make each and every one of our games so lovingly crafted that their quality is recognized in the industry as unmatched. I did preorder the set For Troll & Country. Although I must admit that I am disappointed that the Troll does not have its own separate reference cards & landmark. This makes this really nice miniature not flexible to use and that is just what I want: to make and play my own battle adventures with friends. Just to let DoW know that i’m a Battlelore owner and i’m not pleased about this expansion (and it’s price), about the direction of the expansions (no coherence) and for the total lack of communication about upcoming releases and for not taking into account what the fans want and suggest. not the best days for DoW… i hope it goes around soon. And don’t get me started on the USD 20 = EUR 20 for the memoir overlord expansion. It would be really nice if all the posters here could possibly realize that there is a saying, “If you don’t have anything nice to say, don’t say it at all.” Try constructive criticism in the future, it will get you farther. Welcome to the real world, the world where you can have an opinion may it be positive or negative. I had great expectations since DoW promised to support the game in the years to come (positive). Well we are almost in the 9th month of the year. and let us see what we’ve got. A rather big surprise indeed. Oh yes indeed not the same missteps, another one and in my opinion a really big one. I’m waiting eagerly for mr. Hautemonts comments. With all due respect to Taronstar, this IS what our constructive criticism has gotten us. There has been a plethora of good ideas and positive support for the Heroes expansion, new Lore decks, and new race armies. This has been an ongoing conversation for more than a year. It is time to vent our frustration over the mismanagement of the product line. I will listen intently to what DOW has to say when they return from GenCon but I am not going to be satisfied when they say: Oh, well Heroes is just around the corner. Some basic principles need to change and they need to get back in touch with their fans. My blind support and vocal defense of them are things of the past. They will return once DOW returns to its roots. Okay, so the last one is more of an over-arching issue, but just like films get pre-release viewings to avoid disaster, some forewarning on the Troll release may have given DOW some inkling of people’s feelings prior to its release. I’m not saying they would or could have changed anything, but they might have handled things differently. Also don’t forget that everyone here still adores this game and what it has achieved so far. We just hope to see it have a long and happy existence. The responses show that this Troll expansion is not likely to aid that. I will not be purchasing any more Battlelore related products if this is the way that system will be expanded. It was a poor choice to offer the paper-map, set-piece expansion for a system that is at its foundation modular. It was a poor choice to bundle the troll figure with this ill-conceived format. But to neglect to produce the information card(s) for the Troll by only printing the information on the paper map? That’s ridiculous. The company was better off not offering anything than to produce this bastardized product. At a minimum the information cards needed to be there. What were people thinking over there? What were people thinking over there? its scary-How can they be so totally out of touch? I am VERY disappointed that DOW has decided to begin releasing paper maps. The company has always been held in the highest regard for its’ commitment to high quality components. Playing with paper maps cheapens the gaming experience for gamers considerably. In addition, the release of new figures (particularly non dwarf / goblin figures) have been far and few between. To release the Troll figures in a format that benefits only those that play Epic Battlelore is very unfair to those of us that do not play the Epic version. At the very least, the Troll figure should be made available on its’ own (with an ability card) so those of us who play the 2 player version of Battlelore can enjoy the figure as well. 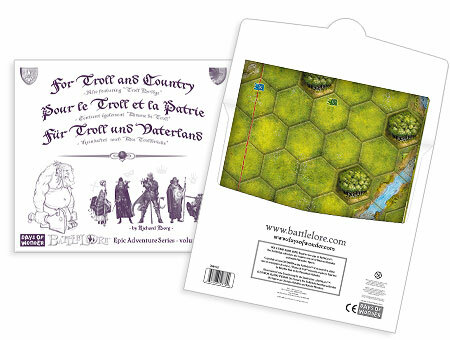 Please DOW, I implore you to maintain your high standards and reconsider you decision to release paper maps (for Memoir 44 as well) and also do the right thing by making the Troll figure also available on its’ own for those who don’t play Epic to purchase. I’m very disappointed too for the same reasons. I proudly own memoir’44 and share Battlelore with my friends…. though we played a hundred games there are more than half of the scenarios still to play. If you buy this expansion, the next ones will be worse. Dow, I enjoy myself sharing time with my friends playing meoir and battlelore but I’m not going to waste my money for poor expansion…. TRUST YOU NO MORE YOU AND WILL NOT BUY EVERYTHING. For instance , instead of buying an unuseful CAMPAIGN BUG (40 euros) I buy FANTASY FLIGHT BRITANNIA(40 euros) .. i.e. an old but WHOLE and EXCEPTIONAL new game that was worth the money. I and my friend Nicola own two memoir’44 base boxes and other expansion…. the operational overlord expansion is unuseful for us…. two set of overlord cards (every time after playing we have to separate our cards)…but 20 euros are too much… with that money we could buy an half new game. not spending every time 16 euros for just one map…. There are also a lot of unuseful thing in what I bought…Cavalry, rope bridges, Carriers, Chindits that are not used in scenarios. The awesome Sinipers rules (Stalingrad red barricades is a wonderful scenario, I won it 10-9 after two hours) are used in only one scenario.